The world of traditional wind instruments opened to her by doing; by learning to remove the bark from birch as long strips and by making simple instruments such as reedpipes. She felt lucky because she got guidance from an old master, Jarkko Aallonloiske. The more instruments she built and the more information Minna adopted about the subject from other people, direct and via literature, the more interesting she found the field. 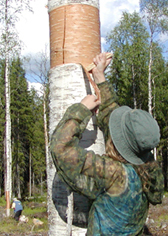 Artisan a nd adventure leader Minna Hokka acquainted herself with Finnish and Karelian shepherd instruments in Turku in late 1990’s. Years passed and Minna kept on visiting Jarkko’s workshop every now and then, learning how to make simple pipes. They made trips to nature and collected useful material for different kinds of instruments. During the last 50 years Jarkko has built dozens of different shepherd instruments which he has presented at various happenings. Also he has made and sold thousands of simple flutes and clarinets and teached thousands of children how to make i.a. willowpipe. Jarkko got his first learning in Helsinki in 1960 from a native Ingrian man, Teppo Repo, with background of fifteen summers as a shepherd in the end of 19th century. Later Teppo Repo became known not only in Finland but also abroad as an original folk musician and talented instrument builder. Repo got guidance for making horns and flutes from his uncle. From man to man, this is how the skills of making musical instruments have been inherited in the course of centuries. models are es timated to be from the Stone Age and the youngest instruments of this research have been collected in 1950’s. First workful months of the project this eager apprentice spent at her master’s workshop making instruments and discussing Teppo Repo and other sublects dealing with tradition. During summer Hokka travelled with Aallonloiske from a fair to another, learning how to present these folky instruments to audience. In the autumn Minna continued her instrument building independently on the basis of the book. Other things came and went in Minna’s life, but she always returned to her workshop. In autumn 2009, after building some 90 instruments, this industrious woman thought it would be possible to get the missing instruments ready by the next summer. She chose the rural Koroinen LUMO-center close to the city of Turku to be the place for the first exhibition of 120 folky wind instrument. The center, name an abbreviation of the words natural material know-how, functions under the administration of Turku University of Applied Sciences. Traditional instruments refined delicately of organic material were accepted with enthusiasm, because the center is founded in order to add knowledge and use of natural materials. In addition to that there was, and is still, the ongoing EU-project ProNatMat, for promoting natural material know-how. After making an agreement about the exhibition to start from the beginning of May Hokka decided to organize the Pipedays III in the middle of May to introduce her works for the professionals of the field. This gathering of people interested in folky wind instruments had earlier taken place in Sibelius Academy and in Tampere University. Minna invited various professionals to lecture and present their skills in the exhibition room with walls full of fresh, but traditional instruments. She also applied for awards for exhibition and days of education. One of the most difficult instruments in the book was the wolf horn, a tuba formed trumpet instrument, whose tube was supposed to be intact. So Hokka had to make several bend parts and join them together. By the way, the echo funnel she made from a piece of an old flagpole. Because the model of this instrument was black, Minna painted the horn with tar. After waiting for it to dry in sunlight for several days with no results, she finally flamed the horn. 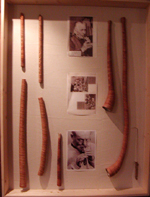 It turned out that there would be more than 120 instruments in the exhibition; for of course Minna also wanted to present the Ingrian shepherd instruments and a couple of other pipes and horns which she had learned from Jarkko. Preparation of the exhibition meant a lot of work besides instrument building: building vitrines, writing introduction texts about instruments and for marketing. Finally the ambitious goal was achieved and Minna opened the exhibition of almost 130 different wind instruments on the 2nd of May 2010. Of course, the instruments could be categorized into few main principles because of the way they produce sounds: flutes, clarinettes, oboes, trumpets, free aerophones and mirlitones. Anyhow, the collection of variations was some kind of proof of folky imagination, which is, according to Minna, a great thing. Decoration of surroundings was natural and odorous; balloons of urine bladders and serpentine of birch bark strips. Fresh springwater and Karelian pastry of blueberry and lingonberry were served for the guests in addition to all kinds of chirps and noises from the instruments. 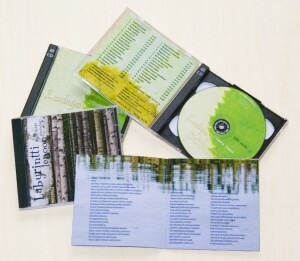 Also old runesongs, Karelian folk songs and modern pieces of music was played by the newborn multi-instrumentalist. In the middle of May some 30 professionals, students and others interested in traditional wind instruments gathered at Koroinen LUMO-Center in Turku. 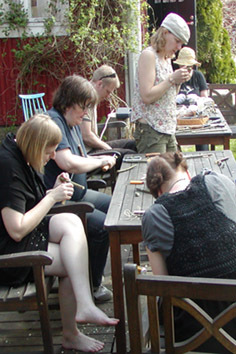 After Minna had demonstrated the exhibition, people were welcomed to move outside to make reedpipes with Minna and Jarkko. After lunch, Professor Timo Leisiö lectured about the history of flutes. Instrument builder, musician and teacher Rauno Nieminen in his turn told about his project of developing the flute. After him, librarian Riitta-Liisa Joutsenlahti from Sibelius Academy informed the audience about a deceased folkartist who also made flutes and other instruments. After this official program people were invited to see a private person’s remarkable collection of brass instruments. For the evening Minna had organized a party which began with guided folkdance. After that she sang her own songs and played some music with her fresh instruments. The big star of the evening was multi-instrumentalist Kristiina Ilmonen with twenty years of experience with wind instruments. On the next day Minna taught participants to build instruments in a folky way. In the afternoon, several archaic instruments were playing with the birds. The first vitrine includes various flutes of different materials like willow bark, feather of swan, tin, birch bark, solid wood, clay and clam. By the way, according to the latest scientist news, a flute of Mammutbone has just been found in Germany, and the flute is 35 000 – 40 000 years old! Next two vitrines present three kinds of clarinets. The difference is at the leaflet; on the oldest and the most widespread models from the Iron Age it is an inseparable part of the stem. Whereas on the youngest models from 19th century the leaflet of juniper or birch bark is fastened with thread. The third model from the 13th century is an interesting combination of the first-mentioned two. In the first vitrine there are mainly instruments from western Finland and in the other the Karelian models are represented. 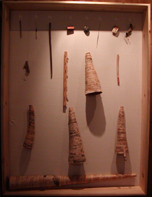 The trumpets of birch and alderbark, many birch bark covered wooden trumpets and an uncovered hooptrumpet are displayed in the first of the four vitrines. In one vitrine there are folky wooden imitations of the rich people’s metallic trumpets: a trumpet, a tuba and a round trumpet imitating an old Russian military instrument. The unique mutkaluikku ~ curveluikku is a trumpet made of naturally curved tree branch and birchbark. 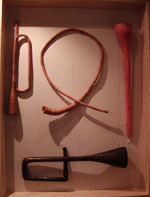 Smaller wooden trumpets of eastern origin and the horn trumpets of buck, cow and bull complements the collection of the finnish-Karelian trumpets. There is still one vitrine which presents archaic wind instruments without a tube in a significant role. On the basis of few basic principles there are again several innovative variations. In addition to that this vitrine displays different ways of fastening the end of a birch bark trumpet. Hokka wants to thank his master Jarkko and Teppo Repo, in addition to all the others who have contributed in the information of these instruments still existing in moderns times. The last vitrine presents Ingrian shepherd instruments and some copies of the models Jarkko has collected from museums. Minna Hokka’s grant aplications were abandoned, sospecial thaks go to Sibelius-Academy for supporting the Pipedays III -happening and to Timo Leisiö and Rauno Nieminen for giving their expertice for the joy and use of everyone. Thanks to Turku University of Applied Sciences and the ProNatMat-project for fair cooperation in the arrangements. Still there are many, many others who made the exhibition and the education days possible – big thanks to them! The first exhibition of Minnas folk instruments was deconstructed on the 17th of september 2010, but the next one takes place in Loimaa, in Sarka, The Finnish Museum of Agriculture. The opening ceremony will be arranged on the 5th of May 2011 and the exhibition will be open all summer. At the Sarka Museum’s monthly Sunday-happening on 29th of May Minna will demonstrate the instruments again with words and sounds. Welcome to hear and see more!